No one will ever accuse Whataburger of not knowing their customers. With their finger firmly on the pulse of South Texas, our favorite orange and white burger dealers know just what their customers want: a chorizo burger. 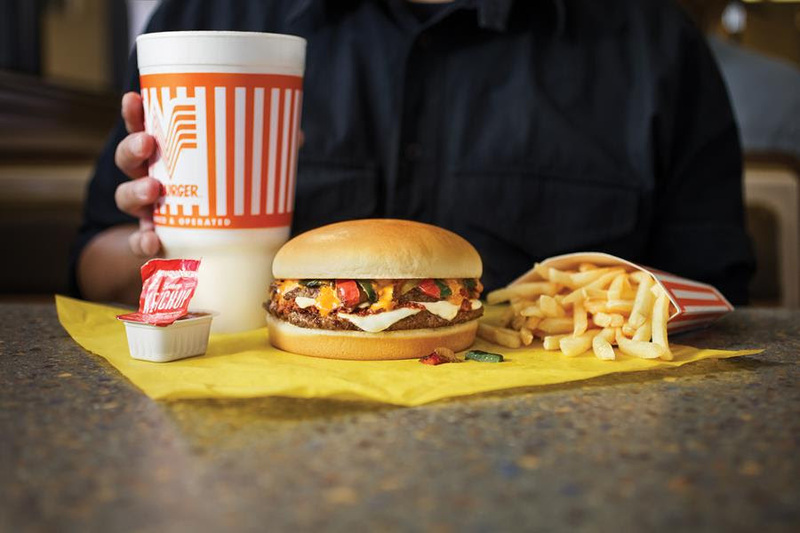 Launched with “ChorizOMG!” branding, the new limited time burger and taquito are sure to become cult classics, revered as much as Whataburger’s reigning fan favorite, The Sweet & Spicy Bacon Burger. 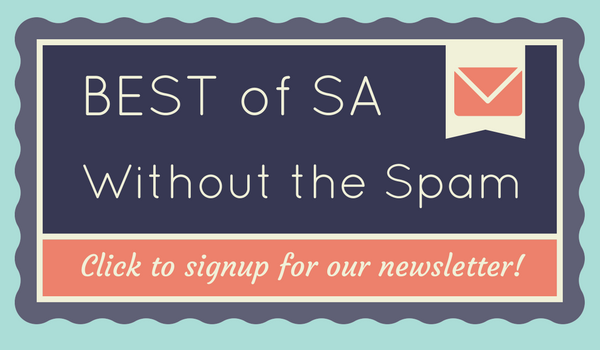 But this delight will be at local San Antonio restaurants for a limited time—so jump on it. Let’s take a look at the burger. 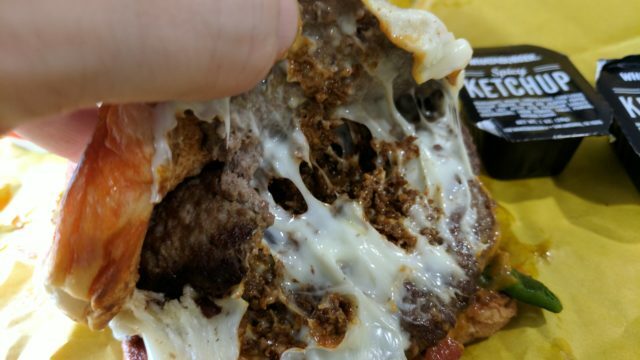 It starts with two of Whataburger’s signature patties on a toasted white bread bun. In between the burger patties, two slices of melty Monterey Jack cheese cradle and protect the spicy chorizo. Yes, it’s a thin layer of chorizo, but in this case only a light touch is needed to pack a flavorful punch. Roasted poblano peppers, red peppers and onions provide your daily serving of Whatavegetables, and a brand new Creamy Chili Sauce (which boasts six different varieties of peppers) tops it all off. This burger packs all of the flavors. All of them. This is a big, bold burger from a big, bold restaurant. Whataburger knows what their customers like, and they know how to bring larger than life flavors to the burgers Texans love. The chorizo itself is well spiced—but not spicy—and fried enough to start to get crispy. The sauce and the cheese provide a bit of a kick, but not enough to make you regret your decisions with late night (or, who are we kidding, early morning) heartburn. Look at all that gooey goodness. Photo by Alan Bush. The one aspect of the burger I least appreciated was the bun. I understand Whataburger doesn’t have an endless supply of buns for each new burger, but the standard bun just didn’t do it for me. Pro tip: order it on Texas Toast for the best experience. 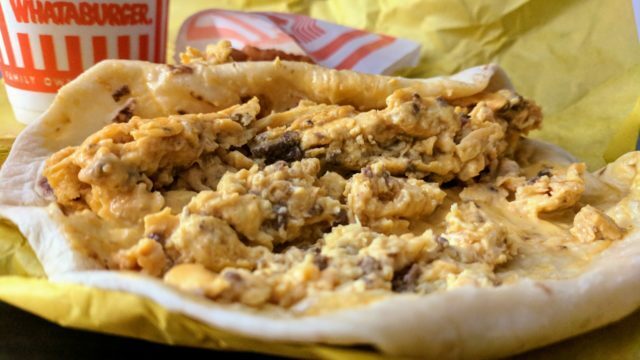 In addition to the chorizo burger, your friendly neighborhood Whataburger also launched their version of a South Texas breakfast staple, the chorizo taquito. This breakfast treat will look very familiar to anyone who’s driven through their local taqueria on the way to work and picked up a few breakfast tacos. The recipe is simple: scrambled eggs mixed with chorizo and cheese on a flour tortilla. 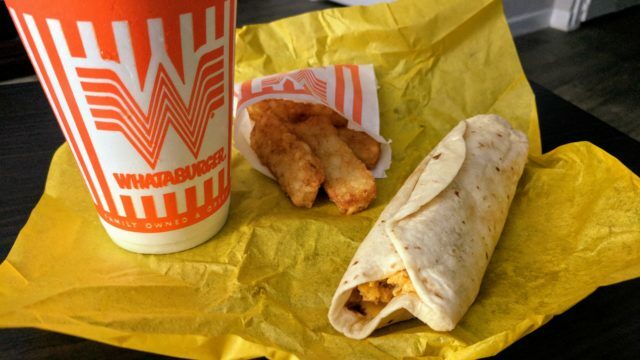 The Whataburger chorizo taquito meal. Photo by Alan Bush. The chorizo is mixed with the eggs, not added as an afterthought—the flavor of the chorizo itself is easier to isolate. They’ve chosen a fairly mild chorizo with a nice balance of spices, which should make this taco appeal to a wider range of customers. 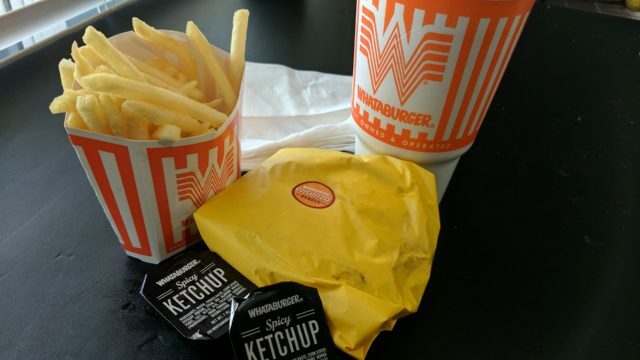 Whataburger uses a slice of American cheese, and serves the taquito with a side of hash browns—a sure sign that your breakfast taco was purchased at a burger chain, and not the mom and pop taqueria down the block. Whataburger chorizo taquito. Photo by Alan Bush. In my taco, the cheese had melted into the consistency of Cheez Whiz, which was jarring, at best. I think a modification is in order here, as well: try it with a slice of the Monterey Jack they use on the burger. The chorizo taquito is fine, but will likely not sell well here in San Antonio, where most neighborhoods have more than one local taqueria to provide breakfast tacos. I think we’ll see plenty more of this burger, but the chain has so far kept quiet on just how long they’ll have chorizo burger on the menu. If you want to try this burger (hint: you do) you’ll need to do it soon. Don’t miss out on this burger (or the taquito) and don’t forget to ask for extra napkins. 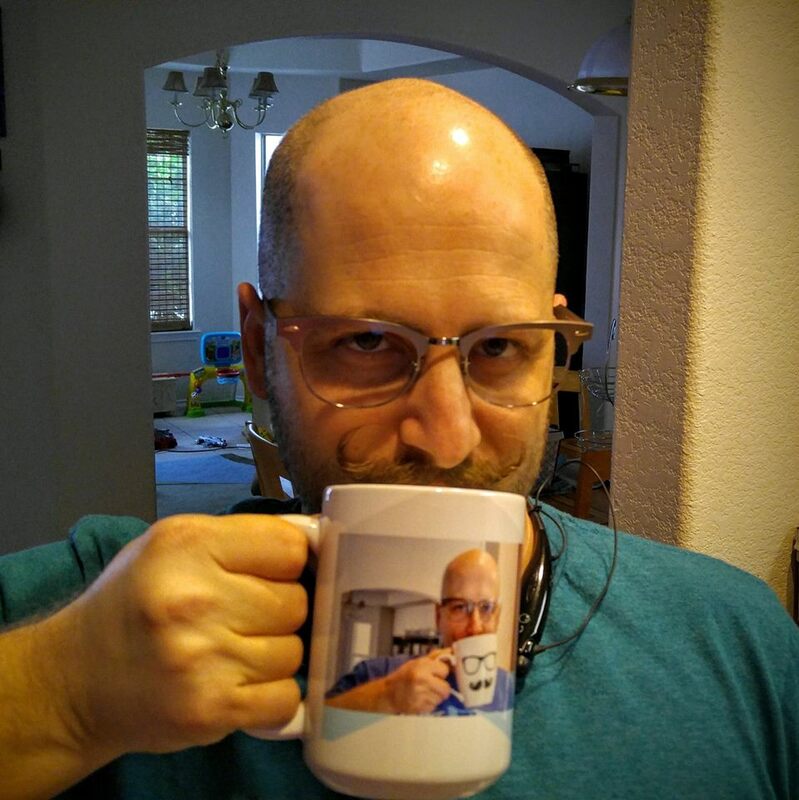 You’ll thank me later.